WASHINGTON, D.C. -- Americans' dissatisfaction with U.S. gun laws and policies has increased to 55%, nearly matching the high of 57% in 2001. Forty percent are satisfied, down from the historical average of 47% since Gallup began asking this question in this way in 2001. Overall, Americans' satisfaction with gun laws ranks near the middle of a list of 19 issues measured in Gallup's 2014 update of its annual Mood of the Nation survey. The highest levels of satisfaction were with the nation's military strength and ability to deal with terrorism; the lowest were with poverty and homelessness and the state of the nation's economy. Americans may be dissatisfied with gun laws because they believe they should be stricter, or because they believe the laws are too strict as they are. 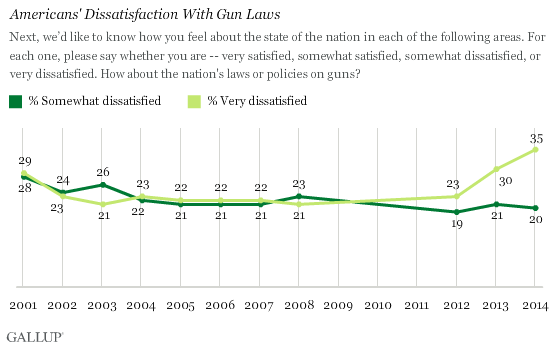 Therefore, Gallup asks those who are dissatisfied with gun laws to choose among explanations for their dissatisfaction. Those who are dissatisfied have historically leaned heavily in the direction of wanting stricter rather than less strict laws. But this year, the gap between those wanting stricter gun laws and those wanting less strict laws narrowed as a result of a sharp increase in the percentage of Americans who want less strict laws, now at 16% up from 5% a year ago. Support for making gun laws stricter fell to 31% from 38% last January. The January 2013 poll was conducted shortly after the December 2012 Sandy Hook school shooting tragedy, which sparked some state governments to consider new gun laws and a robust national discussion about the issue. 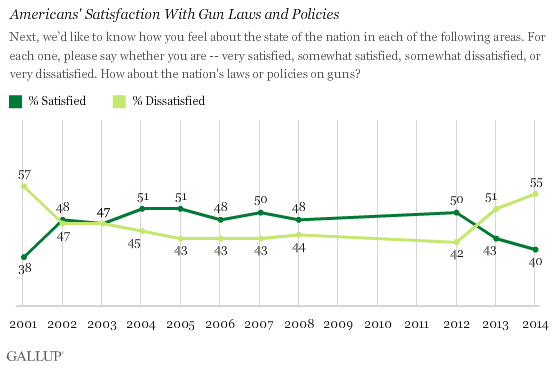 In addition to overall dissatisfaction with gun laws rising, more Americans this year are "very dissatisfied" (35%) versus "somewhat dissatisfied" (20%). The 15-percentage-point gap between these views is the largest in Gallup's trend. In the wake of multiple shootings around the U.S over the last few years, President Barack Obama pledged in his 2014 State of the Union address that he would continue trying to prevent shootings in shopping malls, movie theaters, and schools. Several states introduced legislation in 2013 to restrict gun ownership, although similar legislation failed at a national level. 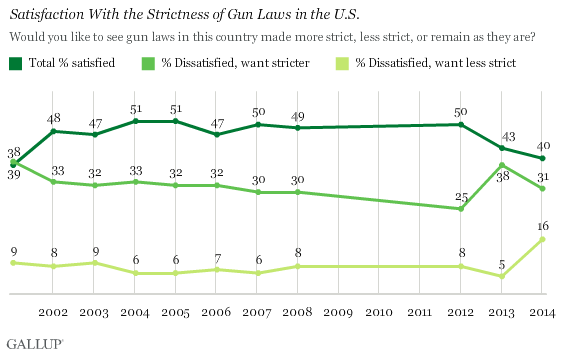 Americans have become more dissatisfied with gun laws over the past year, but this is attributable to a greater percentage who say gun laws are too strict, rather than not being strict enough. Americans' changing views could set the course for future gun law debates and legislation. Worldwide, where are people getting mugged? Many Americans continue to be pessimistic about the nation's current standing, but nonwhites' views have become increasingly positive as whites have become less positive. More Americans say the economy should be a high priority for the president and Congress than say this about any other issue. At least 70% of Americans also deem education, healthcare policy, Social Security, and terrorism important.